HEAT WAVE! Summer is here to stay and with it comes the heat, which can be an added stress for your garden…especially your Hanging Baskets and Flowering Planters. Give them a little extra love with Prairie Gardens Plant Experts top 5 tips, and your planters will make it through the summer looking happy, healthy and extra fabulous. Necessary soil nutrients often run out the bottom of your containers when watering, so it is important add them back into the soil by fertilizing throughout the growing season. We recommend Miracle Grow Slow-release Fertilizer or Liquid Fertilizer according to label instructions. Find them all on our Solutions Wall with Prairie Gardens Plant Experts always on hand to answer any of your garden questions! Proper watering, especially during the summer, is a must. Check out how much, how often, and when you should be watering. When should I water them? The best time to water your containers is in the morning to give them enough time to soak up the moisture before the heavy heat of the day. Plants also absorb water faster during the morning! How often should I water them? In the heat of the summer you should be watering your containers and hanging baskets every day. On hot, windy or humid days you may need to water more than once. And on rainy days you may not need to water at all. How much water should I give them at once? Water your hanging baskets and containers until water begins to run out of the bottom of the container. If the soil is bone dry and the water runs through the bottom very quickly, repeat this process a couple times. How do I know if I am over-watering or under-watering? This can be tricky since the signs of over-watering or under-watering are very similar (yellowing of foliage). The best thing you can do is use the finger test before watering. Stick your finger 1-2″ into the soil…if it is wet, wait to water. If it is dry, water away! 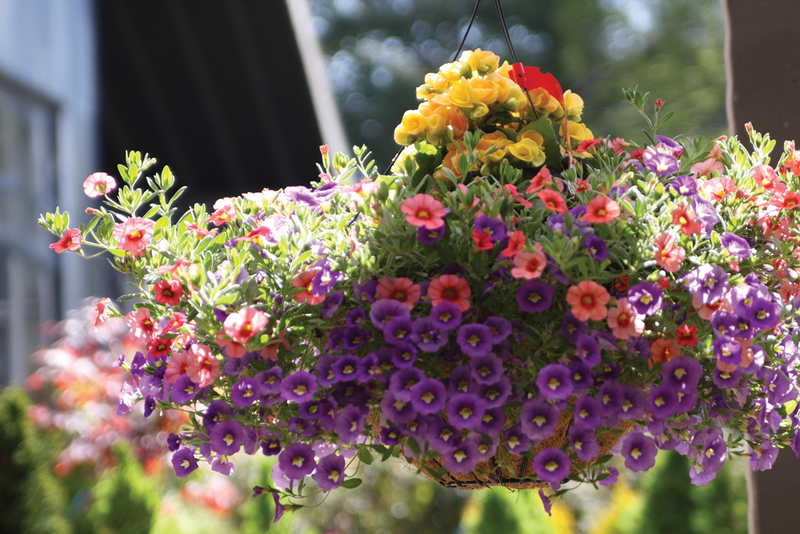 Is your hanging basket or planter looking sparse? Has it slowed down in producing blooms? Or is it growing unevenly? This likely means your container needs a little haircut with a quick pruning. Pruning helps promote new blooms and well-rounded growth habits. Watch the video below to see how to properly prune a petunia hanging basket. QUICK PRUNING TIP: Our Plant Experts recommend pruning back no more than about one third at a time. Some annuals require deadheading, or removing of spent flower blooms. The two most popular container annuals that require deadheading or pinching are Geraniums and Petunias. When pruning petunias, just simply pull off the faded bloom. When pruning Geraniums, remove the whole stem of the faded flower, snapping it off right below the node (see photo below!). Sometimes a missed watering, not quite the right sun exposure or other factors can lead to some plants not thriving in your containers or hanging baskets. If a plant has faded past help, just pop it out and replace it with a new one. Visit our greenhouse for tons of fresh options. Plus, enjoy Summer Nursery Markdowns, going on now!